Q. Why does my boiler run out of hot water faster than usual? 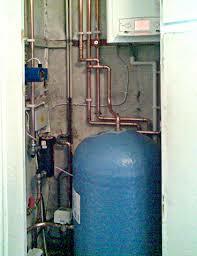 A.If your water boiler is running cold quickly or frequently then several things could be happening. First check the shower head volume to see if your shower is too quick. A new shower head puts out about 2.5 gallons a minute. Some older heads put out 5 gallons a minute. Working with the shower head would double shower length in this case. In some cases, the dip tube on the cold water inlet has broken or worn. When this happens, it creates a short loop for the water, water at the bottom half of the tank will not be used, which makes half of your tank useless. Get it fixed as soon as possible. On electric water boilers, they commonly have two heating elements that work in turns. First the top element heats up the top of the tank, then power goes to the lower element. If the lower element is out, only the top of the tank gets heated. If the top element isn’t working, there will be no hot water. Sometimes the Reset button needs to be pushed or reset. If this doesn’t get the element working, use a voltmeter to determine if the element has shorted out. Replacement of the element may be needed. Q. Why does my water boiler not work as well as it used to? A.This is usually due to a sediment build up in your tank. As water heaters grow older, they accumulate sediment and lime deposits. If these deposits are not removed periodically, the sediment will create a barrier between the burner and the water, greatly reducing the water heater’s performance level. The result is an increase in the amount of fuel required to deliver hot water. Q. What causes hot water to be rusty and brown? A.There are a few answers to this common question. First, chemicals can cause rust in the water lines and a change in the water pressure will cause the rust to loosen up and come through the water lines and into the shower, bath, or other appliances. Another cause could be a break in the pipe. What you may be seeing is dirt. What happens is when water is flowing and on, and then you suddenly turn it off, it creates a slight low pressure in the line which pulls in dirt around the pipe. When you turn on the flow, that dirt is pushed along until it comes out of the tap or showerhead. After several cycles, you can have a dirt in the lines, which dissolves and makes the water look brown or rusty. Another possibilities could be that the glass lining in the water heater may be compromised, allowing the metal jacket to rust. If this is the case, you don’t have long until it starts to leak and will need to be replaced. Q. When I fill a container with hot water it is milky, but after a few minutes, the water in the container clears up. What causes this? A. Complaints of discoloured water are commonly blamed on water heaters and storage tanks, but in fact, it is a rare occurrence for today’s high quality glass lined tanks to have a lining failure significant enough to allow water to contact enough bare metal to discolour the contents of even a small tank. The most common cause of “rusty” water is a non-toxic iron reducing bacteria, scientifically termed Crenothrix, Leptothrix, and Gallionella. Water heaters and storage tanks usually require new anode rods as presence of iron bacteria contributes to premature anode failure. The simplest treatment available is shock-chlorination of the system. This is a surface treatment, and often requires repeated trials in heavily infected systems. The chlorination of a system requires that you follow each step explicitly to avoid an un-treated portion of the piping system from reinfecting another part.